To say it has not been the greatest season on the pitch for Fleetwood Town is an understatement but Cian Bolger has issued a thanks to the fans for their support. 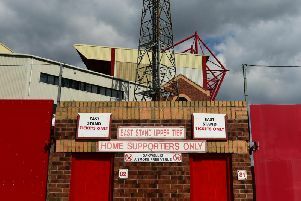 This time last year Fleetwood went into their final day clash with Port Vale two points behind second-placed Bolton Wanderers with the chance of clinching automatic promotion. The Trotters though stormed to a 3-0 win over Peterborough while Town were held to a draw by relegated Vale to end any hope of a first promotion to the second tier. This year, however, Town faced a battle at the wrong end of the table but they and their final day opponents, Walsall, are now safe from the drop. Bolger was crowned player of the season last year and, as they prepare to hand out this season’s prizes in Jim’s Bar after Saturday’s match, the defender hopes they can end on a high. The players will start their summer holidays next week and will return in June under a new head coach in Joey Barton once he replaces John Sheridan. He comes in after a season in which Bolger admits he and his team-mates have not shown their abilities. Should results go their way then the highest they could finish is 14th – and the defender admits it has been a frustrating season compared to this time last year. Bolger said: “We set the standards a lot higher than we achieved this year but it is disappointing. “We are going to go away, get a good rest and come back stronger next year. “If you look back at the start of the season we have set targets that we have not reached. “We have not fulfilled our potential but we have just got to come back stronger.